Fleming’s executive chef Russell Skall has created an innovative three-course dinner that will cure winter blues with bold and flavorful offerings. 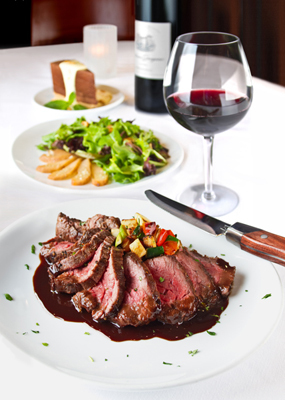 The new Winter Prix Fixe menu offers the choice of appetizer, two entrées and dessert for $39.95 per person. This menu is available now through March 29 at both Chicago area Fleming’s Prime Steakhouse & Wine Bar locations: 25 E. Ohio St.; 312/329-9463 and 960 Milwaukee Ave., Lincolnshire; 847/793-0333. Guests choose Hearty Mushroom Soup or Roasted Pear and Candied Walnut Salad to begin, followed by a choice of one entrée: Bistro Steak, served with ratatouille and cabernet butter sauce; or Crackling Pork Shank, mashed sweet potatoes with Asian barbecue glaze drizzled with cilantro oil. Dessert is a Chocolate Mousse Cake, almond brittle and crème anglaise. The nationally acclaimed Fleming’s Prime Steakhouse & Wine Bar offers the best steakhouse dining – prime meats and chops, fresh fish and poultry, generous salads and side orders – with a unique wine list known as the “Fleming’s 100” that features 100 wines served by the glass. Fleming’s is the recipient of numerous prestigious awards, including Wine Enthusiast’s annual Awards of Distinction and Wine Spectator’s annual Awards of Excellence. Chicago has its own Chowdah Fest & its tonight!